Thousands of people are still stranded at the sweltering San Juan airport in Puerto Rico with little access to food, water or cash -- much less a flight off the island. Planes are leaving, just not enough to clear the terminal any time soon. Eighteen round-trip commercial passenger flights are scheduled Wednesday, according to the company that manages the airport. That is almost double the number from Monday and Tuesday but a fraction of a normal day. People are desperate to flee Puerto Rico since it was ravaged by Hurricane Maria a week ago, leaving most of the island without power and plunging it into a humanitarian crisis. Inside the airport terminal, generators are providing the only power, and there is no air conditioning. Heat, humidity and the crush of bodies make it feel like more than 100 degrees. "We just want to get home and get back to our routines, our lives. 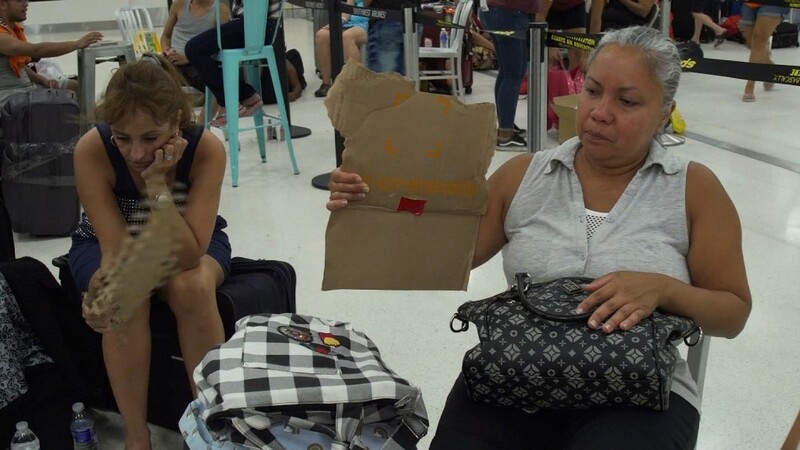 I don't feel safe here," said Doris Montalvo, who was at the airport Tuesday night, trying to get home to Connecticut with her daughter, three grandchildren and her daughter's boyfriend. She said she was told she might not get on a flight for two weeks. Besides commercial flights, some humanitarian relief flights are getting into San Juan. Airlines are delivering food, water, medicine, blankets, cots, generators and blood for the Red Cross. Charter, military and cargo planes are also delivering supplies for FEMA. The FAA reported almost 100 takeoffs and landings in all on Tuesday and said it should be able to handle 36 an hour during daylight on Wednesday as it repairs damaged radar. United Airlines (UAL) said relief flights are returning with as many people as can get on the plane. United also resumed scheduled passenger service on Wednesday for the first time since the storm. With takeoff and landing slots limited, airlines say they are also using larger planes than normal to handle more people. American Airlines (AAL) used widebody jets on two of three round-trip flights Tuesday, instead of the normal single-aisle jets.